The Mozambique Resources Post Oil & Gas Industry Industry Analysis: Can Angola Overhaul Its Struggling Oil Industry? Industry Analysis: Can Angola Overhaul Its Struggling Oil Industry? It is quite rare for African national oil companies (NOCs) to liberalize, especially in countries that are heavily dependent on oil revenues. Yet Angola, whose stability was sent reeling by the oil price crash of 2015-2016, is making great strides in transforming the national champion Sonangol into a more accountable and competitive business entity. With this, the new presidential administration hopes, the whole of Angola’s oil production would swing back to growth (or at least settle for a lengthy stagnation). The scope is genuinely ambitious – the new government wants to restructure Sonangol, terminate the company’s sole right privileges, sell off some off its assets including several fields, as well as to create a National Oil and Gas Agency, which would take over Sonangol’s regulatory and license-granting competence. In most cases numbers are more than enough to explain such a swift policy turn, in the case of Angola it is doubly so. Most of Angola’s production is deepwater and ultra-deepwater, making it especially susceptible to sudden oil drops and other market shocks. Having survived two such occurrences in 2008-2009 and 2014-2016, Angolan oil production in general fell from a 2008 level of 1.896 mbpd to the current 1.48 mbpd. Similarly, the national oil company Sonangol saw its oil output drop by some 27 percent to 0.59 mbpd. Moreover, to the Angolan authorities’ utmost regret, the year 2017 ended with no exploration drilling whatsoever (just for the sake of comparison, 2014 witnessed 24 wildcats drilled). No matter how hard the task of ramping up crude production in a mature environment, the case for reform solidified. Graph 1. 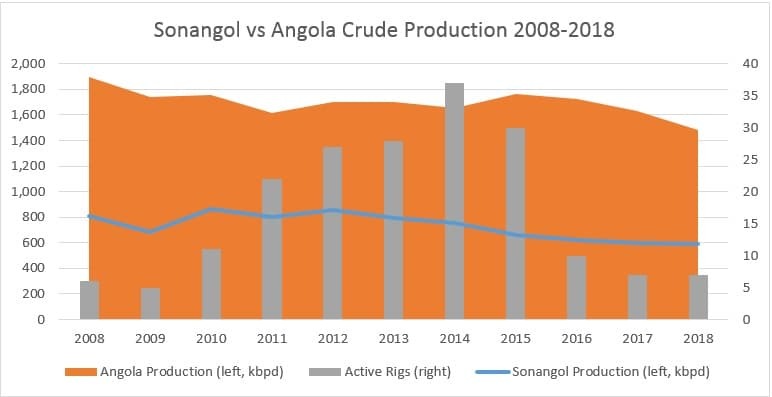 Sonangol vs Angola Crude Production 2008-2018. Apart from falling production, there are also other indicators that point to the inevitability of structural reform in one of Africa’s foremost extraction states. Foreign currency reserves have halved since oil prices fell dramatically in 2014, leaving Lourenço with no other option than to devalue the Angolan kwanza (which should have been done a long time ago, not January 2018). Sonangol has been ailing financially, too – first it sought out development loans from the Chinese Development Bank in 2014-2015, then the Angolan government had to hand it out a $10 billion cash infusion in 2016-2017 so that the national oil champion can pay out its debts and arrears. As Sonangol finds it increasingly more difficult to secure financing from leading banks, it relies more on government-backed money, dragging further down Angola’s public debt standing which is expected to drop by 5 per cent this year to 68 percent of GDP. President Lourenço’s transparency drive also has political motives – in order to lessen the grip of the dos Santos over the country’s leading firm, he dismissed Isabel dos Santos, the former President’s daughter and concurrently Africa’s richest businesswoman. The new Chairman, Carlos Saturnino Guerra Sousa e Oliveira is a technocratic figure, thus a suitable candidate to help Lourenço dismantle the nepotist ties that held Angola’s energy sector together thus far. In fact, Lourenço’s only politically viable way out is to construct a more inclusive energy sector that would accommodate a wider spectrum of interests than merely those of a close political circle, otherwise Angola’s populace would erupt in dissatisfaction. Even though Angola’s part of GDP coming from oil production slid from 45 percent in 2011-2012 to the current 13-15 percent, it is a most needed change. The Lourenço-style structural reform plan is in fact the continuation of a 2016 dos Santos revamp initiative that was never really translated into reality. It includes the reshaping of oil-related ministries (already done, Mining and Petroleum ministries were merged into one), the establishment of a new sector-wide regulator to lessen Sonangol’s role in regulatory matters (if all goes well the National Hydrocaron and Biofuel Agency, ANHB, will be created next year) with ANHB taking over as overall manager of Angola’s concessions, a role which previously was the prerogative of Sonangol. Sonangol’s restructuring will also entail its shedding of non-core activities, ending years of financially dubious investments in healthcare, real estate and housing. The creation of a new regulatory agency automatically triggers the question as to what would happen with existing concessions when they are transferred to the new entity. When Indonesia carried out the same measure in 2000-2001, deals valid at that time were left intact as the new regulator simply acknowledged their validity. The ongoing restructuring drive actually allows the Angolan government to readapt existing concession by granting out more favorable terms to investors in return for their pledges to intensify drilling in Angola. The above measures altogether would leave Sonangol worse off, smaller in complexity (the company now boasts a hundred subsidiaries) and scale, however, would definitely turn out to be a net benefit to the country on the back of new oil investments. The new government is also intent on selling some Sonangol assets to streamline the company’s operations – selling deepwater Blocks 20 and 21 (previously licensed out to Cobalt Int. Energy) in the Kwanza Basin is the first step, it is estimated that more will follow along the privatization lines. There is even more – a new gas framework is a key element in the Angolan reform drive. Heretofore, when a gas discovery was made, any third-party contract holder would not be entitled to it as Sonangol was stipulated as the sole owner of the nation’s gas reserves (the production-sharing contracts usually dealt only with liquids). Following the adoption of the Natural Gas Framework Law, foreign entities can fully claim both associated and non-associated gas reserves – even though the law has no automatic retroactive effect, companies can reclaim reserves in case they relinquished them.